First of all, Beauty Will Rise came out yesterday. (And do you have it yet?! Yes, AK, I know you do.). Even though this album was birthed as a result of the death of his daughter, Maria, this is one of his most beautiful albums because it rather accurately expresses grief in a God-honoring way. Briefly stated: this album ministers in a way that music was designed to do. There are many ways to express grief. I don't think anyone does it perfectly, not even SCC. We may not always be able to do it perfectly (what would that even look like!? ), but we are always able to do it well. 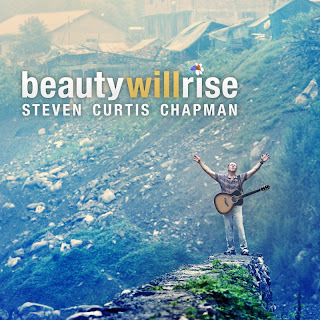 I like how Steven Curtis Chapman is brutally honest in these lyrics. That, folks, is true Christianity. Earlier today I talked about false Christianity which says that life as a Christian should always be perfect. Happiness and joy are most certainly a part of Christianity but so is sorrow. Sorrow IS a good thing if it ends by doing what it is designed to do - draw you closer to God. I love that SCC shares his struggles and his deepest pain. Yet he represents what is true: we are finite beings who do not see the big picture. But God does have a plan for us and it is good. We just can't see beyond the moment sometimes. I didn't post this video earlier because the album hadn't been released but now that it has, I feel a little better about including this clip. This is the title cut from the album. This album causes me to relieve most of our year, but it does so in a positive way. It acknowleges pain, doubt, tears and moments where you find yourself unable to breathe. And then, gently, it ministers to your heart and brings you full circle, back to the cross where we meet a loving God who meets us in the pain and pushes us forward by drawing us unto Himself. It is a great mystery and a beautiful blessing. Wow! Thank you for the contrast of these last 2 posts. Hm. SCC...my all-time favorite man of Christ. I've been waiting for this album for a long time. He really is a God-followe in every respect, and he has all my admiration. The hardest part of my walk with Christ is knowing how much He has brought me through and yet STILL I panic! I have fought with this for years, KNOWING I only had to give over to God and yet fighting to keep my hands gripped around every circumstance. "Relying on God has to begin all over again every day as if nothing had yet been done..."
YES! That's me! Each day I have to get up and commit it to God, every moment, every circumstance, every tear, every smile. Because He is always faithful, because I can count on Him, because I am a frail, panicky human being who needs reassured at every turn of my path! Yes, I still panic, but I have faced my humanity and I bow to His grace. Life's a struggle but it's beautiful because I trust His plan. "I have faced my humanity and I bow to His grace." Well written - great review. Completely agree. I haven't bought an album/CD in a looooong time because I just can't justify the cost with a great Christian radio station (local, even!) and the fact that most albums have only a few "good" songs on them. I think I might have to make an exception for this one, though. I think the real attraction of Christianity is this type of overcoming faith--a faith that doesn't "overcome" in that there are no problems, but rather a faith that triumphs through the problems. Beauty from ashes: amazing grace.